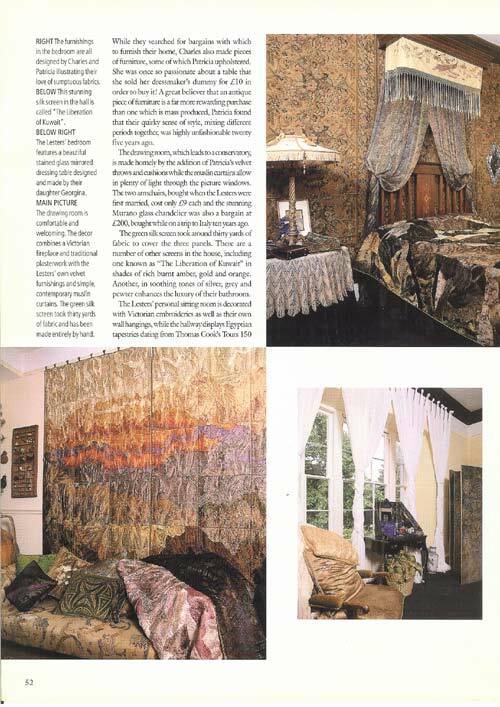 The home of Charles and Patricia Lester is a showcase for their fabulous textile designs. Lucille Grant is treated to an exotic tour. provides the base and inspiration for the textile designs of Charles and Patricia Lester. It lies in the picturesque valley of the river Usk near their factory, an old Victorian workhouse which, like the house, they have converted entirely themselves. The Lesters’ speciality is sumptuous hand painted and pleated silks and velvets made into stunning dresses worn by celebrities including Sian Phillips, Pauline Quirke and Elizabeth Taylor. 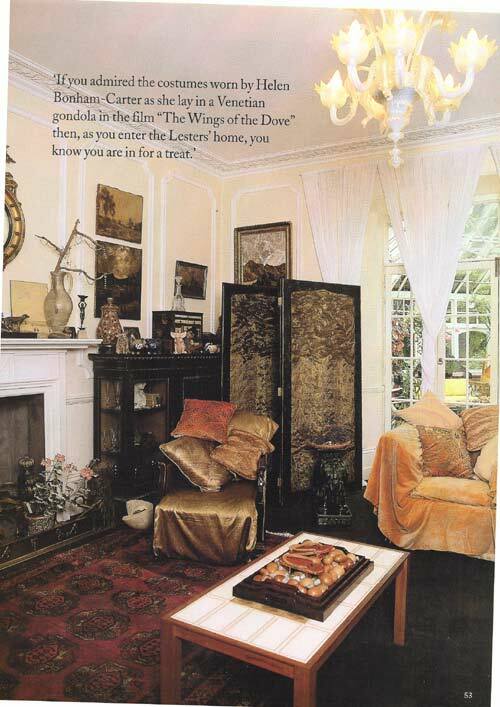 If you admired the costumes worn by Helena Bonham-Carter as she lay in a Venetian gondola in the film “The Wings of the Dove” then, as you enter the Lesters’ home, you know you are in for a treat. 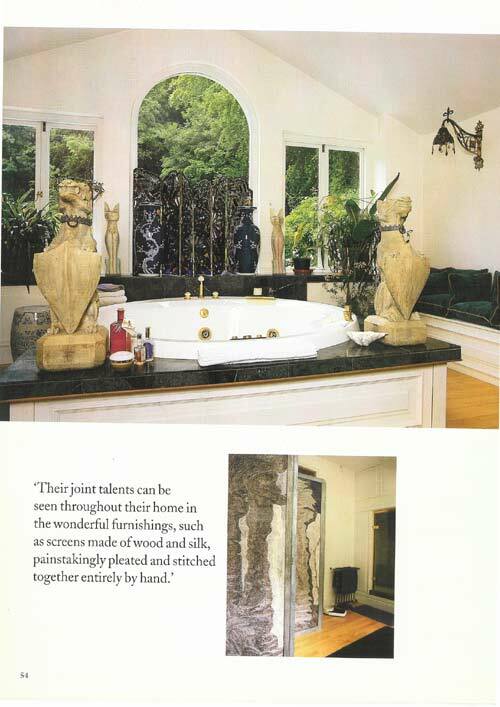 An extensive knowledge of textiles has led to the Lesters’ expansion into the world of interiors. Their designs, which include silk tapestires, bedspreads, curtains, throws and cushions, with more than a hint of 19th century British Aestheticism, resemble antique textiles. Patricia feels that many of the skills employed by our grandmothers are in danger of being lost. 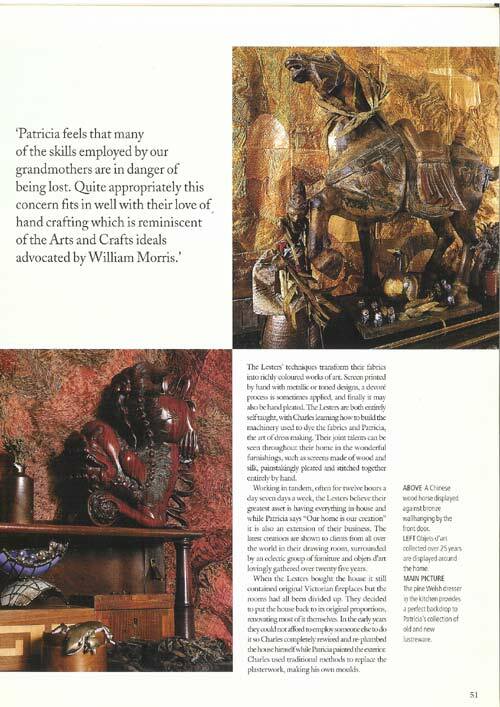 Quite appropriately this concern fits in well with their love of hand crafting which is reminiscent of the Arts and Crafts ideals advocated by William Morris. Above: The foot of the Victorian fireplace in their bedroom is a showcase for Patricia’s collection of shoes. The Lesters’ techniques transform their fabrics into richly coloured works of art. Screen printed by hand with metallic or toned designs, a devore process is sometimes applied, and finally it may also be hand pleated. The Lesters are both entirely self taught, with Charles learning how to build the machinery used to dye the fabrics and Patricia, the art of dress making. 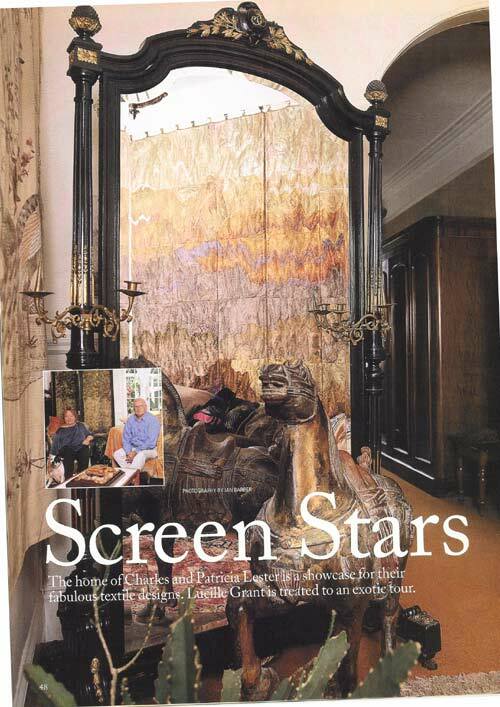 Their joint talents can be seen throughout their home in the wonderful furnishings, such as screens made of wood and silk, paintakingly pleated and stitched together entirely by hand. 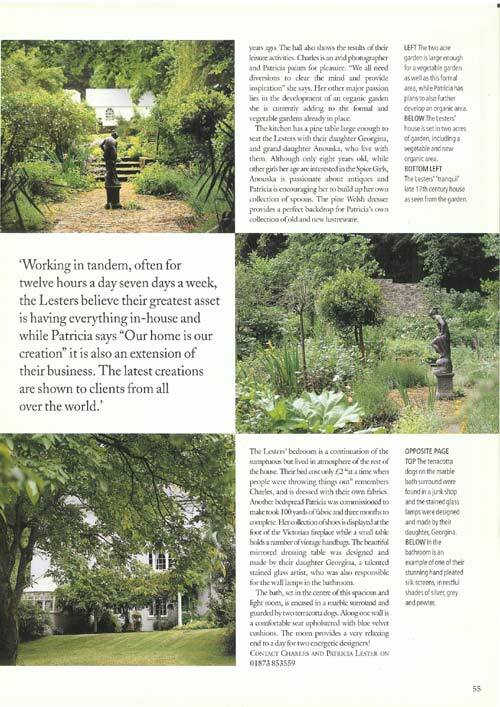 Working in tandem, often for twelve hours a day seven days a week, the Lesters believe their greatest asset is having everything in-house and while Patricia says “Our home is our creation” it is also an extension of their business. 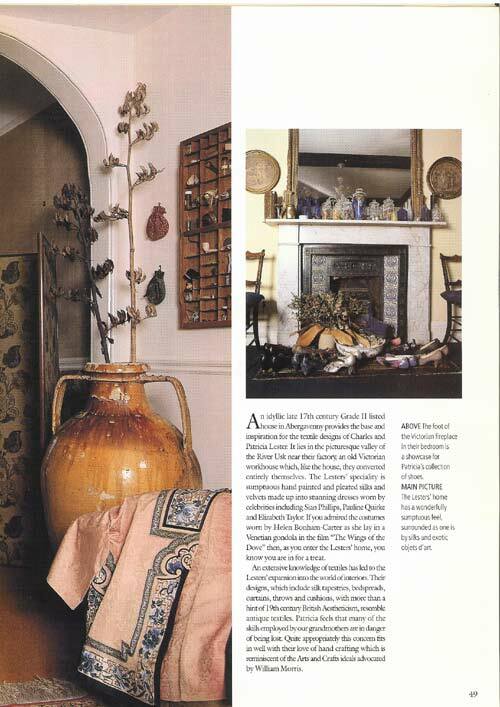 The latest creations are shown to clients from all over the world in their drawing room, surrounded by an eclectic group of funriture and objets d’art lovingly gathered over twenty five years. When the Lesters bought the house it still contained original Victorian fireplaces but the rooms had all been divided up. They decided to put the house back to its original proportions, renovating most of it themselves. In the early years they could not afford to emplopy someone else to do it so Charles completely rewired and re-plumbed the house himself while Patricia painted the exterior. Charles used traditional methods to replace the plasterwork, make his own moulds. While they searched for bargains with which to furnish their home, Charles also made pieces of funiture, some of which Patricia upholstered. She was so passionate about a table that she sold her dressmaker’s dummy for £10 in order to buy it. A great believer that an antique piece of furniture is a far more rewarding purchase than one which is mass produced, Patricia found that their quirky sense of style, mixing different periods together, was highly unfashionable twenty five years ago. The drawing room which leads to a conservatory, is made homely by the addition of Patricia’s velvet throws and cushions while the muslin curtains allow in plenty of light through the picture windows. The two armchairs, bought when the Lesters were first married, cost only £9 each and the stunning Murano glass chandelier was also a bargain at £200, bought while on a trip to Italy ten years ago. The green silk screen took around thirty yards of fabric to cover the three panels. There are a number of other screens in the house, including one known as “The Liberation of Kuwait” in shades of rich burnt amber, gold and orange. Another in soothing tones of silver, grey and pewter enhances the luxury of their bathroom. The Lesters’ personal sitting room is decorated with Victorian embroideries as well as their own wall hangings, while the hallways displays Egyptian tapestries dating from Thomas Cook Tours 150 years ago. The hall also shows the results of their leisure activities. Charles is an avid photographer and Patricia paints for pleasure. “We all need diversions to clear the mind and provide inspiration” she says. The Lesters’ bedroom is a continuation of the sumptuous but lived in atmosphere of the rest of the house. Their bed cost £2 “at a time when people were throwing things out” remebers Charles, and is dressed with their own fabrics. Another bedspread Patricia was commissioned to make took 100 yards of fabric and three months to complete. Her collection of shoes is displayed at the foot of the Victorian fireplace while a small table holds a number of vintage handbags. Their beautiful mirrored dressing table was designed and made by their daughter Georgina, a talented stained glass artist, who was also responsible for the wall lamps in the bathroom. The kitchen has a pine table large enough to seat the Lesters with their daughter Georgina, and grand-daughter Anouska, who live with them. Although only eight years old, while other girls of her age are interested in the Spice Girls, Anouska is passionate about antiques and Patricia is encouraging her to build up her own collections of spoons. 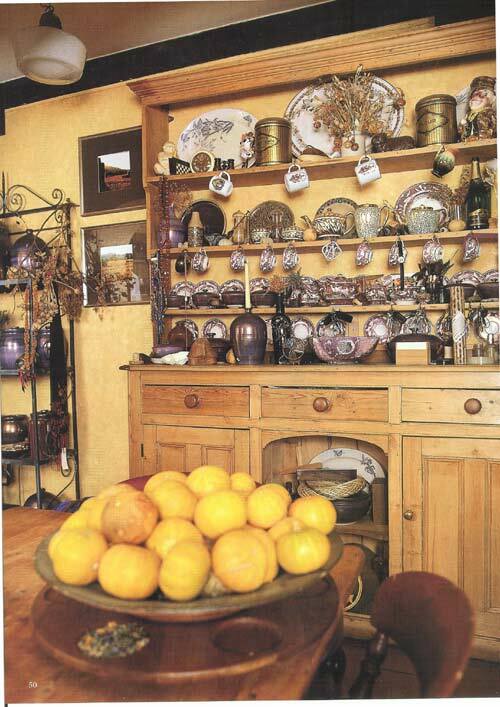 The pine Welsh dresser provides a perfect backdrop for Patricia’s own collection of old and new lustreware. The bath, set in the centre of this spacious light room, is encase in a marble surround and guarded by two terracotta dogs. Along one wall is a comfortable seat upholstered with blue velvet cushions. The rooms provides a very relaxing end to the day for two energetic designers. Her other major passion lies in the development of an organic garden she is currently adding to the formal and vegetable gardens already in place.